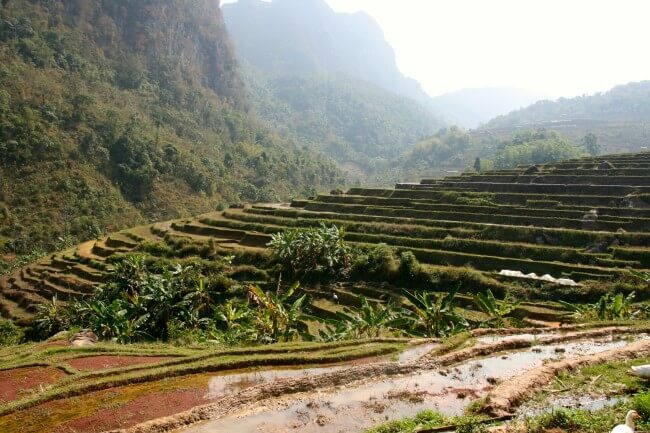 I boarded a sleeper train for the mountainous north-west region of Vietnam clutching a large can of Heineken, a pack of chocolate Oreos and a bag of rice crackers (that I was later to become addicted to). This was a send off… Vietnam-style. 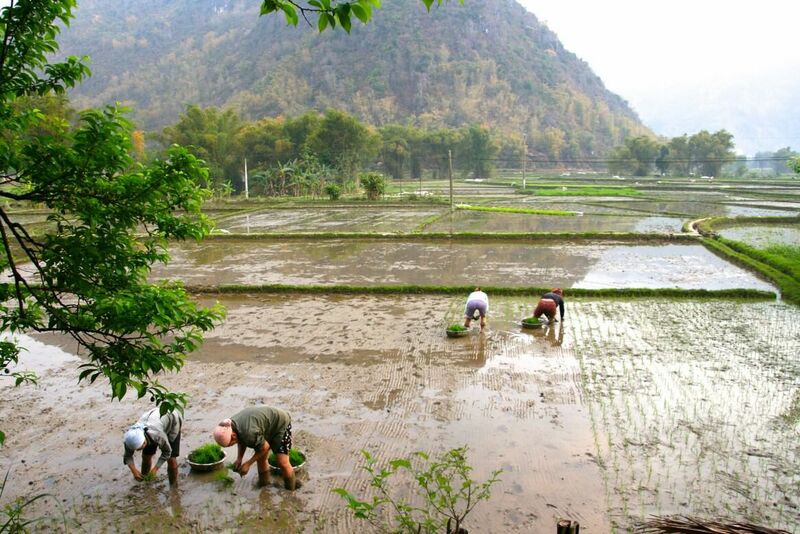 After spending the eve of the Lunar New Year in central Vietnam with the lovely Duyen and her family in central Vietnam, followed by a couple of very special days with Diep and her wonderful family in Hanoi, it was time to take my final ‘research trip’ for work. As I left the cosy surroundings of Diep’s family home, her mother thrust me a can of beer, talking avidly at me, with a sparkle in her eye. Diep laughed. “My mother says you like beer, you must have a big beer for the long train ride,” translated Diep as she put cookies and rice crackers in my bag. I was not to go hungry on this journey. 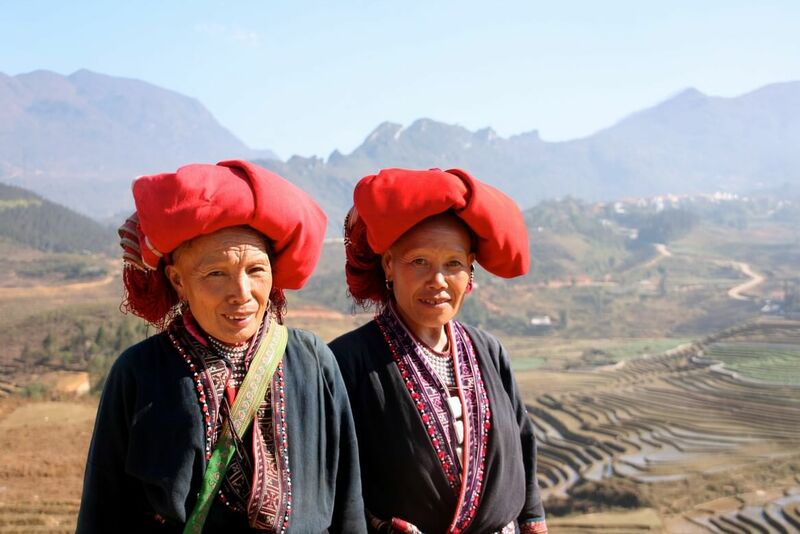 The first destination was Sapa, where terraced rice paddies and beautifully-adorned tribal women paint the scenery in a riot of colours. 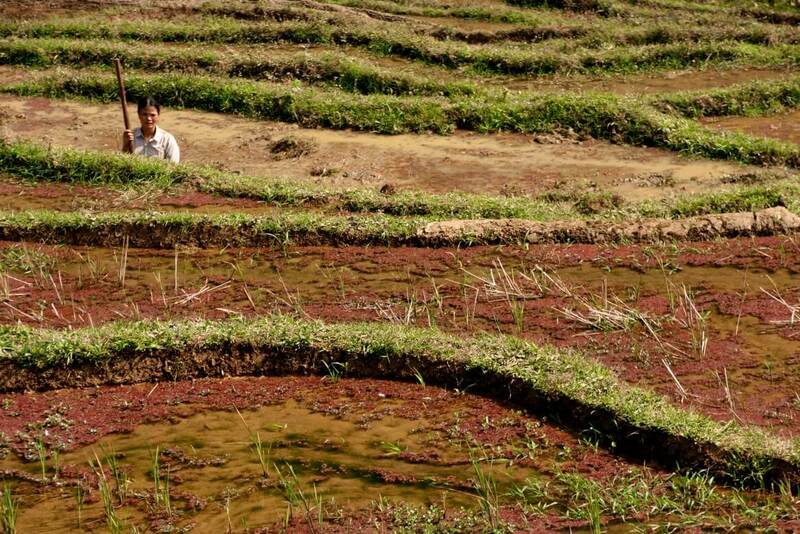 Irrespective of the season, and whether the rice is green, yellow, gold or brown, the rich coloured fabrics of the H’mong and Red Dzao tribes set the fields ablaze. 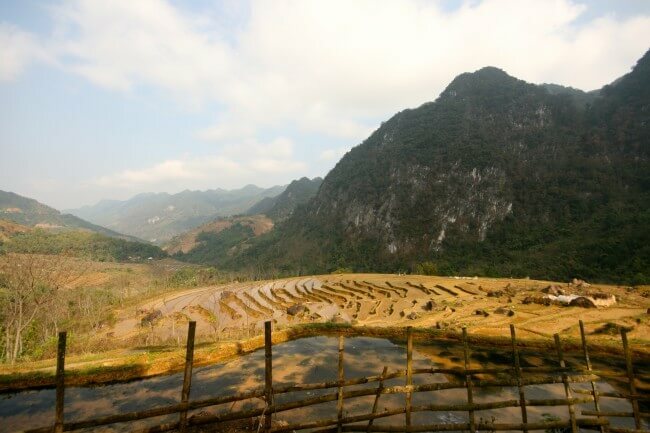 From Sapa I travelled southwest to the region of Mai Chau – but this time in the company of Diep and two of her friends. Here I was treated to miles and miles of unspoilt beauty – from vibrant green tea plantations and acres of rice paddies to crystal blue lakes and deep jungle – the horizon was only broken by the occasional small wooden house or women working the fields, often with water buffalo trailing behind them. There was not a tourist in sight. 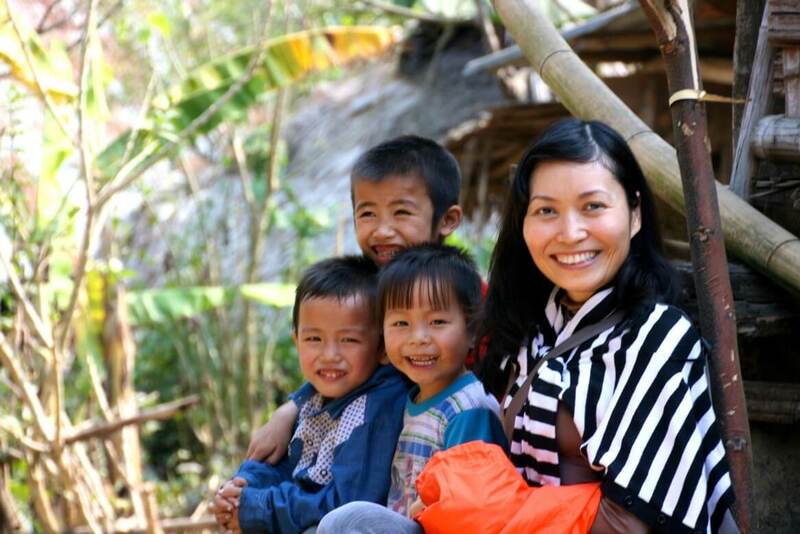 The lovely Diep with some of the local villagers. Thanks to Diep’s infectious personality and fabulous translation skills, I found myself learning all about how to make the perfect pig feed from an elderly lady in a remote village, eating various plants and leaves as we walked through forests and even drinking rice wine with an ethnic Thai family, who kindly showed us their house before sharing their home-brew with us. Seeing their kitchen, I hasten to add, was a personal highlight – a huge cauldron bubbled away in the centre with buffalo meat and chicken hanging from the blackened bamboo ceiling above it. 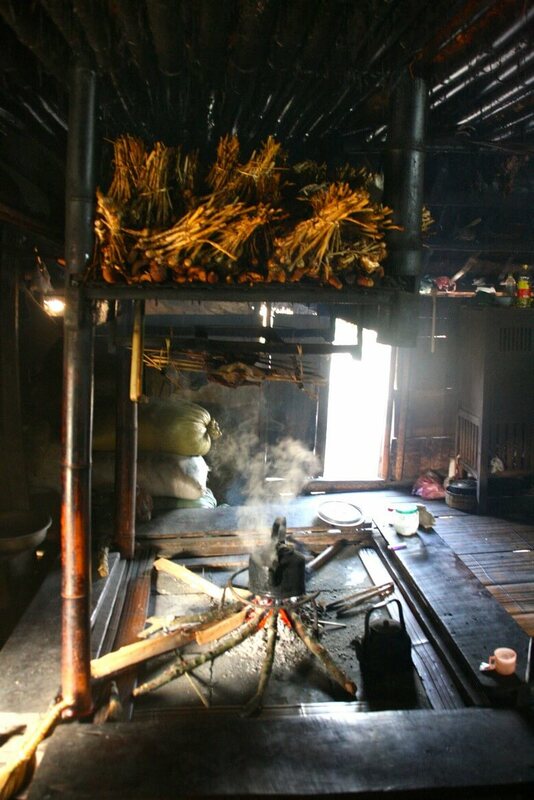 Sitting on the bamboo in the ‘loft’ were dozens of tightly bundled spices and herbs, gently flavouring the meats as they smoked for days on end. A sneak peek inside the Thai home. 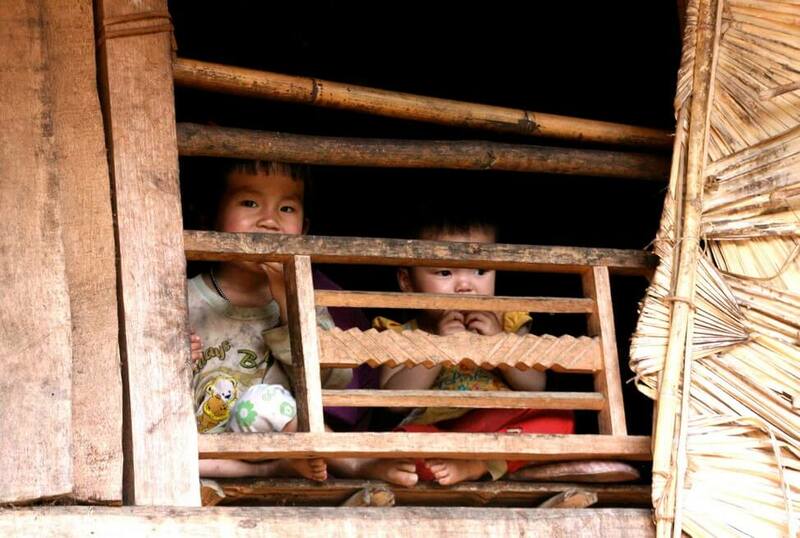 It’s been a very special five months and Vietnam is a country that has got under my skin. With the sound track of a thousand whizzing motorbikes, the smell of burning incense and the taste of sweet spices and rich coffee; it is addictive. I feel honoured to have stayed here long enough to know that you shouldn’t leave your freshly squeezed lime in your bowl of Pho, that chopsticks are turned the other way when taking food from a communal plate and that the man who shakes the clacker on his bicycle is actually offering massages. But more than anything I feel blessed to have met some very special people who have made me feel so welcome in this beautiful country. 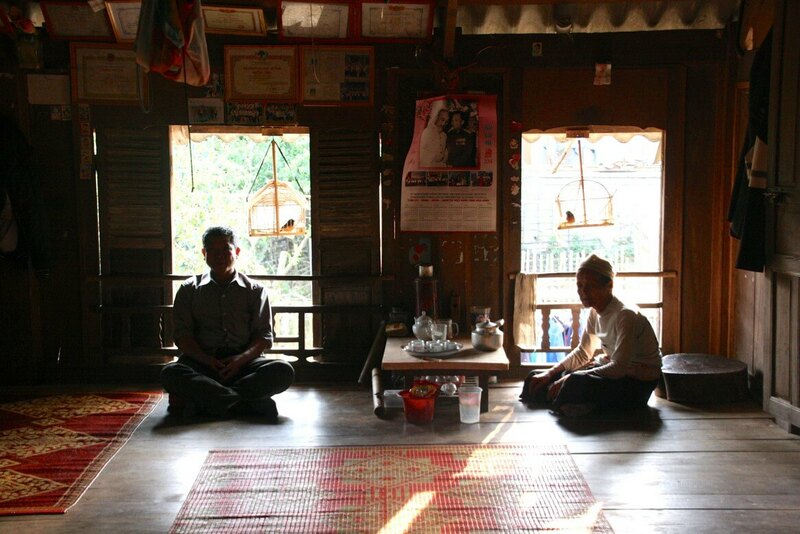 Before leaving Diep’s family house to board my flight to Sri Lanka – and eventually back to the UK – Diep’s mother invited me to pray to their ancestors at the family shrine on the top floor of the house, so that they could look over me. I bent my head three times with Diep to the smell of the burning incense. As the warm morning sunlight streamed through the large windows, her dad held my hand and urged me to return soon as her mother handed me a bag of bananas and Diep tucked a jar of home-made dried sweet coconut slices into my bag. I was not to go hungry on this journey. It was, of course, a send-off… Vietnam-style. This entry was posted in Recent Posts, Vietnam by Delia. Bookmark the permalink. I’m so glad you solved the mystery of the clacker bike men!! Delia, I loved this post and almost felt your sentiment, nearly moved me to tears! I think you should write a novel based on all your experiences! Thank you for sharing this with me. Your writting talent is amazing. It put a smile and tear. I am so glad that we have met and spent that short, wonderful time together.